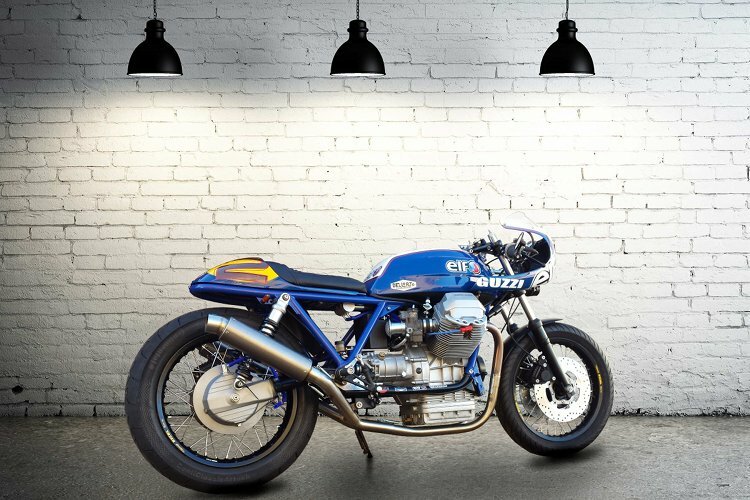 Moto Guzzi Mille GT Cafe Racer by RCG Rocket Custom Garage. 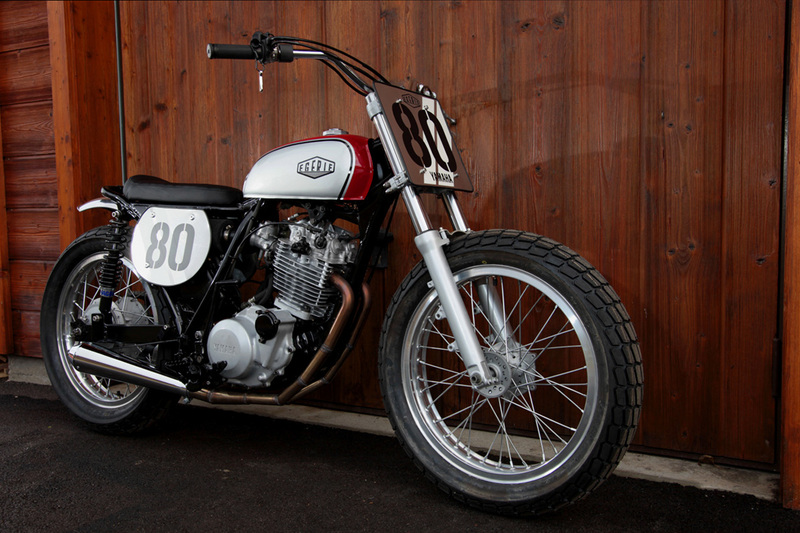 Ron Fairbrother began building bikes after his early retirement from the military. 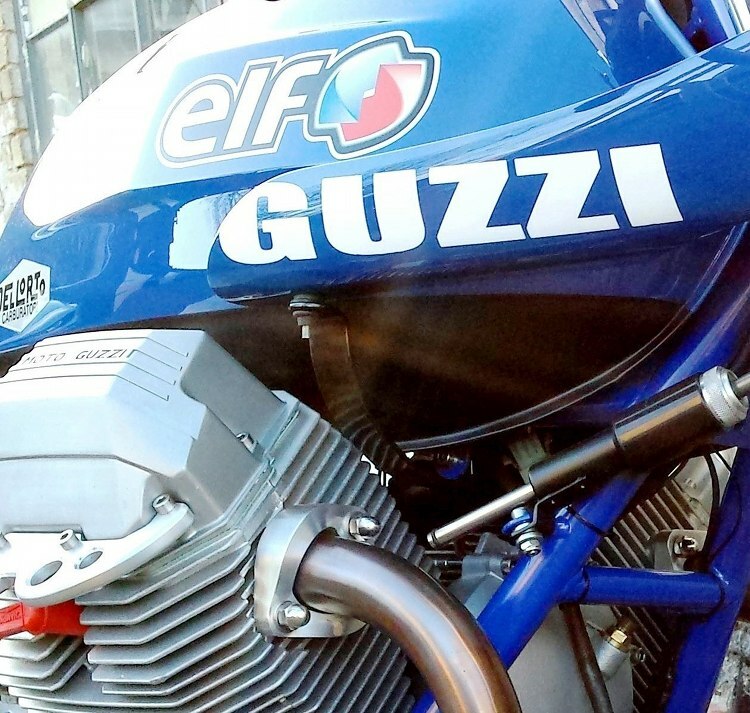 After three previous builds, including this incredible Kawasaki Zephyr, Ron felt the urge to take on a Guzzi. 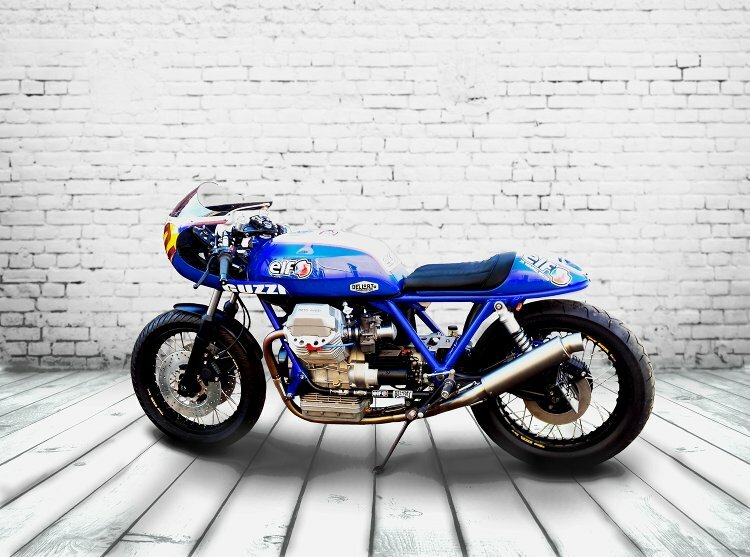 After a little searching, he ran across a rather tatty 1980 Moto Guzzi Mille GT with 32,000 miles on the clock — the perfect candidate. 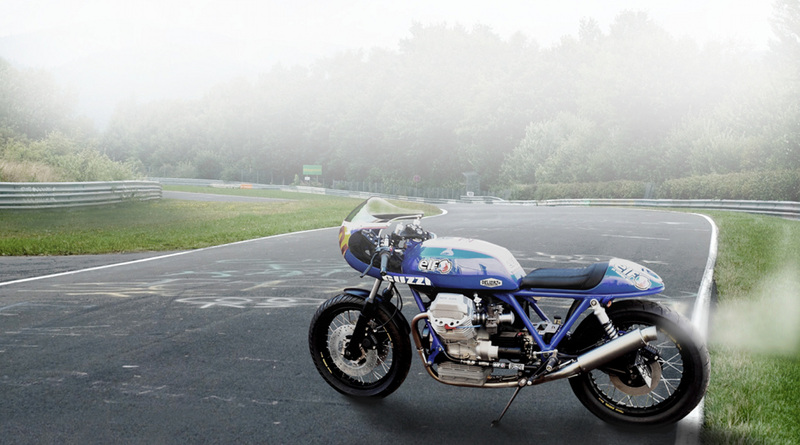 Below, get the full story on this Brit-built, French-inspired, Italian-bred cafe racer! 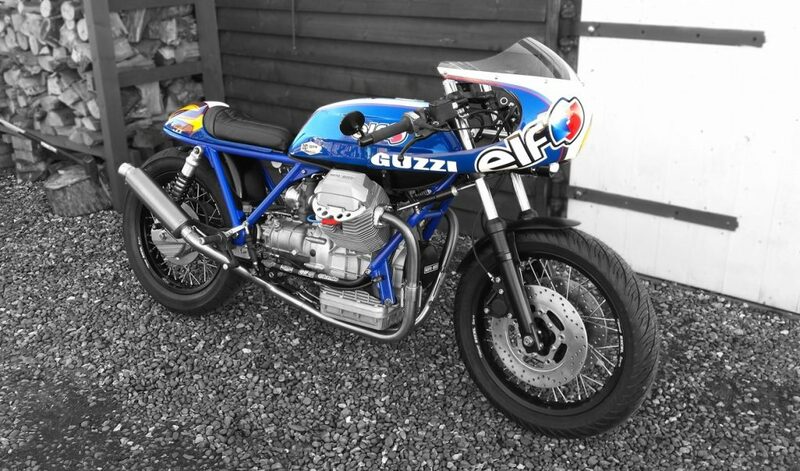 This is a hobby after a forced early retirement from military life and I now felt the urge to do either a BMW airhead or a Guzzi in some guise or another. 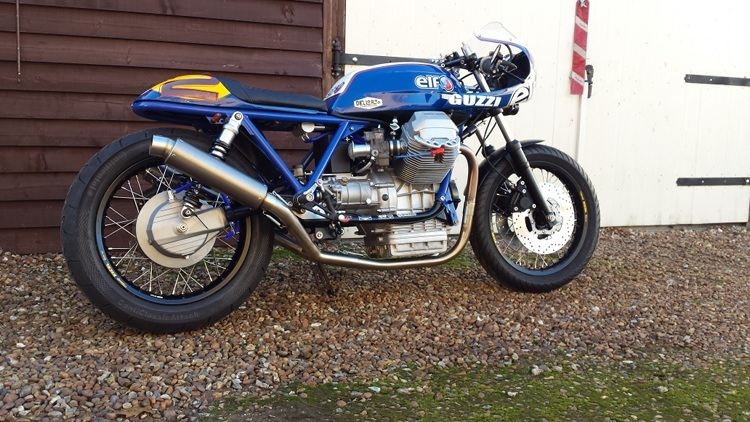 Luckily this came up, a tatty, but working, 25 year old Guzzi Mille GT. It basically had a Tonti frame and an engine in good nick but it all needed some pretty intensive sorting. So, she was stripped, gutted back to her rusty old bolts. The main stuff was kept for restoration and the rest, including bodywork, brakes, forks and superfluous electrics, were flogged on the same site I bought her from or binned. The frame was delugged completely, the rear ends removed, and a hoop of same diameter steel added to the back, then all was blasted stove enamelled in zinc oxide and a top coat of shiny new blue. The frame was blown out to remove the crud from the blasting, and it was at this stage I decided to breathe the motor into a collector and out via the rear rather than vent into the frame for safety reasons. Rear shocks were sourced from The Shock Factory and are smashing quality too. Front forks are pretty much all new with progressive springs, new stanchions and dampers, held together with the original yolks, only the black lowers are original. Front and rear wheels are originals but with new rollers and spokes and a satin black enamel. Brakes were given the new treatment too, opting for new but different style discs and new oem Brembo calipers. The bars were made from thick alloy tubing to get the wider stance that I prefer for riding, holding a new Brembo master and clutch lever, a Ducati 748 kill switch and universal switchgear for the right side. This pretty much sorted the rolling chassis, bar the blasted and stoved swingarm and all new bevel gear internals. The electrics are a bastardised original loom with the new switchgear and GPS speed grafted in, in such a way that gives me easy removal of all unwanted stuff for the track. 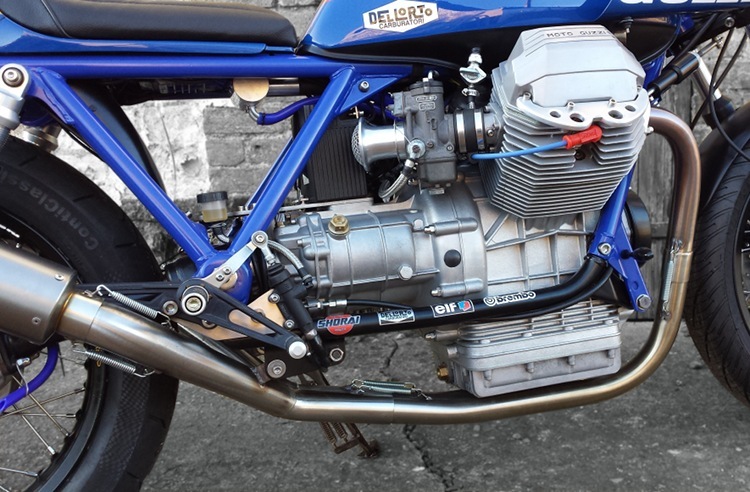 The battery was the biggest single weight saving, weighing in at 1.3kg, opposed to the near 13kg of the original, and is housed between the carbs thus keeping the frame clear under the seat. It was only after constructing this, did I see Kaffee Maschine’s method of hiding the battery under the gearbox. 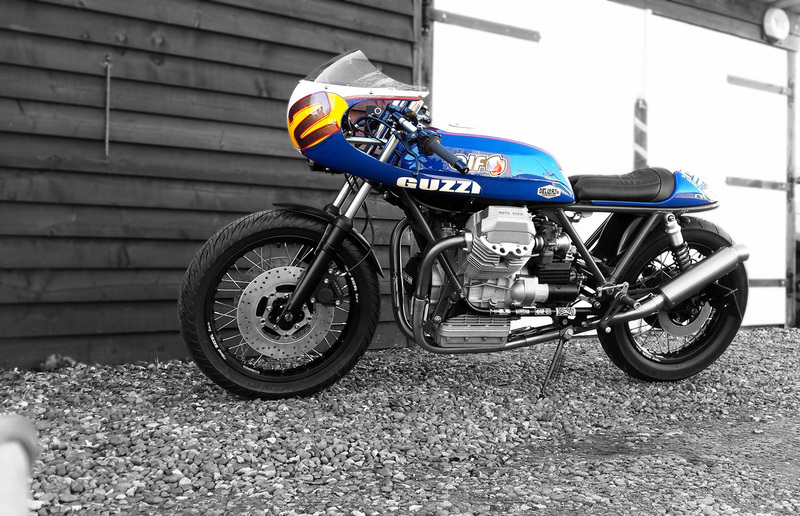 Hey it is my first Guzzi build. Anyway, while we are on the weight saving, my estimate for the total bike is an overall reduction of about 35kgs. The engine is key to this bike’s looks, so I handed it over to my friend Paul Curtis, an engine genius, who builds Laverda’s for himself whilst rebuilding engines of all makes for others. Once gutted, it was aqua bead blasted ready for my original plan of black enamel; however, once I had seen the immaculate blasted finish, I just couldn’t bring myself to cover it in paint. Good move because it looks splendid now. He fitted new valve springs, valves, shell bearings and rings etc., along with a 2.3kg flywheel versus the 4.2kg original and a new clutch. The remainder was left untouched as it showed no sign of wear. The carbs were kept original too, just re-built with new parts and re-jetted for the bell mouths now the airbox had been junked. And the bloody thing started first time, sounding proper nice through the new stainless pipework and titanium end cans. 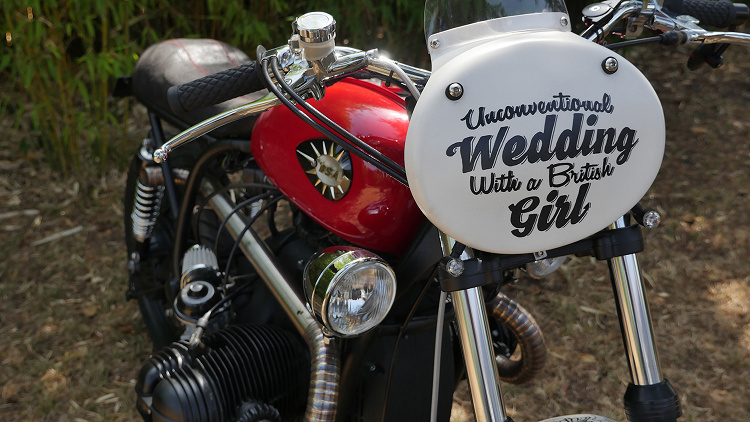 I do like a loud bike. 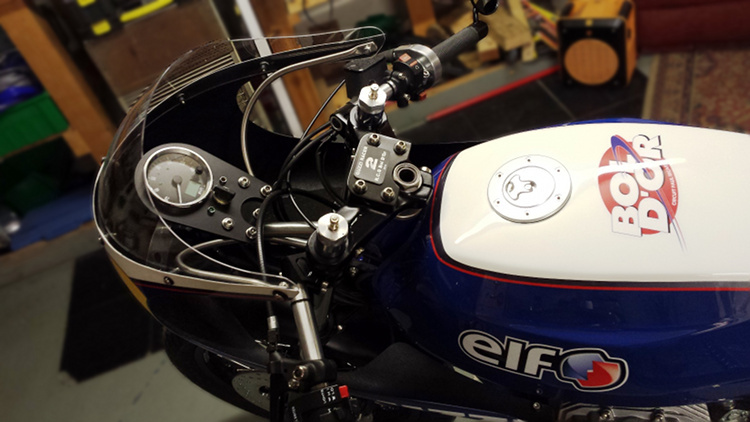 The seat unit was from an auction site, the used Le Mans tank was off the net too, and the fairing is the Con1 from Airtech Streamlining in the US. 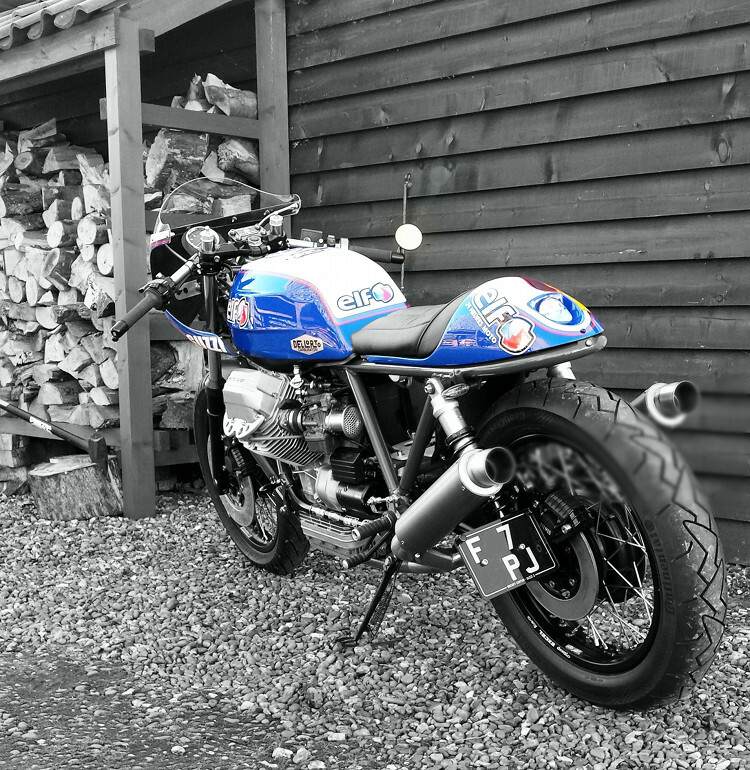 It’s smaller than the usual BMW/Guzzi affair and fitted well with new bracketry; more to the point, it doesn’t dominate the front of the bike like the latter do. The screen was cut down by me for a more retro/custom look. And on to the paintwork. This was completed by the master himself, Ty Lawyer at Pageant Paintwork. The tank required much reshaping prior to paint and the overall effect is stunning in the flesh. The only thing I’m not 100% with is the seat, which I will have re-done in the new year; apart from that she’s awesome all over. 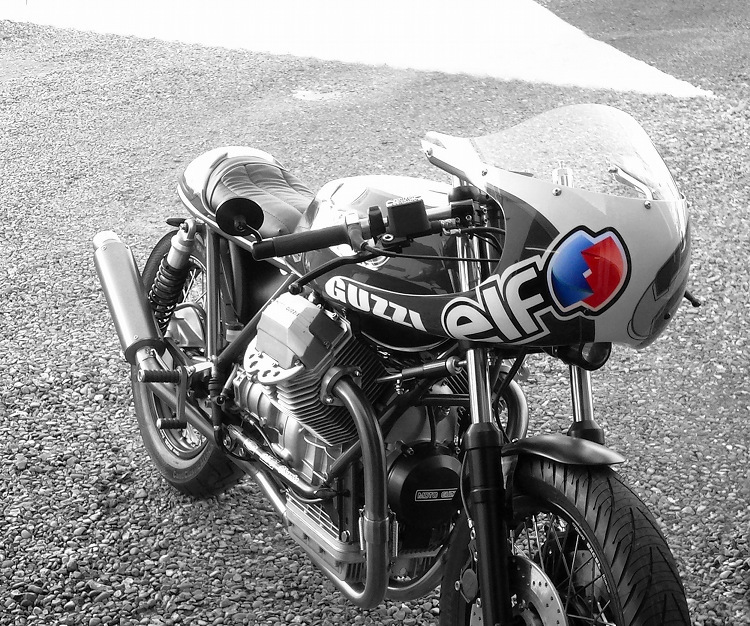 It’s a tribute to my visits to the Bol D’or in the 90’s, in the South of France. Mad days racing each other through the mountains, camping, drinking and generally being incompatible with polite society. Proper biking.